Is it, or isn't it? Shark or Surfer? Gra Murdoch takes one final look as he speaks with Australia's top shark biologist, Dr Andrew Chin. Despite first hand accounts, sequences and ‘irrefutable evidence’, White Horses Editor Gra Murdoch remains unconvinced, though he wishes not to be. Wow, this has been fascinating. Have you heard the ‘Serial’ podcast? Reporter Sarah Koenig spends a year investigating a single, murky, ambivalent legal case, and the story unfolds from week to week. This shark/paddler thing reminds me of listening to ‘Serial’, where the listener, along with the reporter, is confronted by conflicting evidence – just when you think that, yes, 100 percent, person X did that to person Y, another detail will come to light and you’ll be forced to rethink your position and accept that no way could person X do that to person Y. But then the following week, more things will come to light and you’ll be back where you started. And on and on. ‘Serial’ is epic. I highly recommend it. 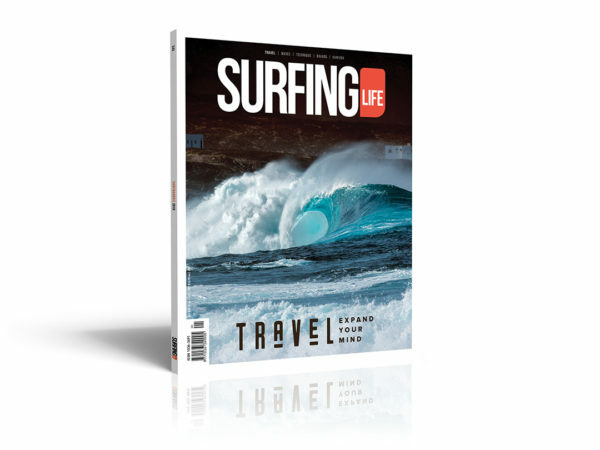 It’s epic to see Braithy from Surfing Life go above and beyond. I understand he spent several hours on the phone with Mr Hasson through the night and has chased up several leads with old-school journo ticker. Speaking of heart, Braithy’s first concern is for the wellbeing of young Eden and it’s a credit that Braithy recognises the fragile humanity in the situation. Just so we’re clear. I’m not after a ‘gotcha’ moment here. I take no joy in challenging Mr Hasson’s photo and swimming against the tide of eyewitness accounts. But much as I want to, I just can’t override what I see. But I’ve certainly been wrong before. Been editing and studying and ID-ing surf photos for 29 years so bound to make mistakes in that time. I remember ID’ing a silhouette photo of Nick Carroll at Burleigh once. Swore black and blue it was him. He had been out. I’d seen him out there. Turns out it was a local bloke, Jye Brazenas. In the moment that photo was taken, he just had Nick’s stance, posture, positioning, everything… “But he’s more Nick than Nick” I remember blurting out pathetically in my defence once the truth was revealed. Certainty is always a dangerous position to take. So, I’m not certain. Can’t be certain. Wasn’t there. All I have is an experienced eye, Occam’s Razor, and empathy for the crew involved. And so what follows is speculation that flies in the face of wakes and sequences and eyewitness accounts. So there’s every chance I’m off target here – but I just reckon this might have been an unintentional thing that blew up. A mistake. An oversight. No-one’s guilty of anything. It’s not like this was an elaborately constructed hoax. It’s not like Mr Hasson is a soccer dad seeking notoriety for his young lad. That would be nasty and inappropriate conjecture. But the thing with Social Media is that it all can get away from you pretty quickly and explode into the mainstream. One second you’re having a laugh getting likes and lols, the next minute you’re being interviewed on breakfast television, smiling under the lights and possibly wishing you’d deleted the damn thing off the memory card. It wouldn’t be unusual for surfers to share a lineup with a juvenile Great White in this neck of the woods – hell, there most likely WAS a GWS in the vicinity, and I believe the story about the crew being whistled in – happens often. And it’s not unusual for sharks to become visible in a wave. And so when this image popped up on the viewfinder, well it certainly looks like a shark doesn’t it. Stranger things have happened. From Eden’s POV, you lose track of all the waves you catch. especially when you’re a supergrom. Can’t remember everyone else in the lineup and their positioning etc etc. Maybe the power of suggestion overwhelmed what happened. As far as the sequence goes, the shots were spaced out. A lot of things come in and out of frame from shot to shot. Certainly looking through the viewfinder you don’t see the lineup. So, yep, shark in the lineup. No worries. Happens often. But I still reckon that’s not a shark in the photo. Cos with a bit of contrast and saturation thrown into the image, it REALLY looks like a duck diving surfer. This is where Occam’s Razor gets applied. Forget everything else, the wake, the accounts, just look closely at what is in front of you here. I’m not the only one who has this view. Dr Andrew Chin was one of the two shark experts initially quoted as confirming this as a Great White. He now believes this might not be the case. So to recap. I’m sure Mr Hasson and crew are genuine when they say they believe it’s a shark in this image. I believe them when they say there was a shark in the lineup. No big deal. And I certainly don’t think anyone’s played any dishonest digital trickery. 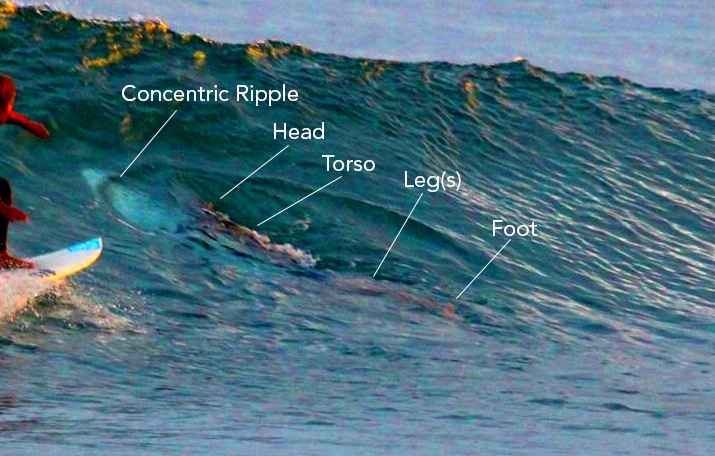 But I stand by my opinion, rightly or wrongly, that this is a duck diving surfer in the frame here, and the ‘mouth’ of the shark is an illusion formed by the concentric ripple that surrounds the submerging surfer. Here’s a test. If you’re looking at the pic on a half decent monitor, cover up the shark’s ‘mouth’ with your finger and what do you see now. I like to think it’s not a hoax, it’s an innocent optical illusion.